DOFE Handmade Dream Catcher, Dream Catchers with Lace and tassels,Big Dream Catchers for room decoration.Best Gift for Girls. (Fluorescent green) by DOFE at Home Decor Outlet Store. Hurry! Limited time offer. Offer valid only while supplies last. 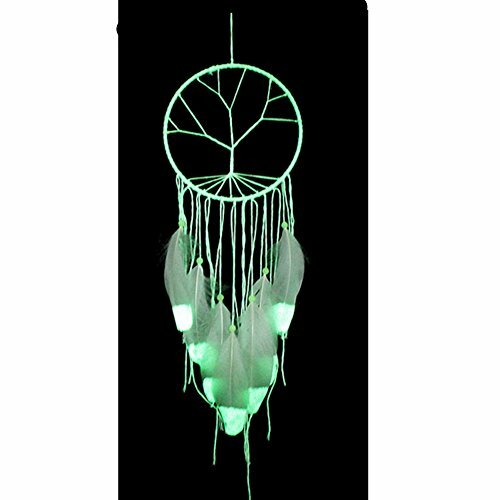 Beautiful dream catcher, for you to stop the nightmare to retain the good dream and blessing. The dreamcatcher is made of handmade, smooth feathers, made of natural wood beads or stone beads or synthetic pearls.Colourful, it is the choice that bedroom decorates best. Size：Large circle diameter: 6.2" , total length:23.6". Each feather is fumigated, rigorously screened to ensure flawless, and harsh requirements create the perfect quality. A dream catcher is a good choice for a wedding gift or a bridal shower. It represents your blessings to others. If you have any questions about this product by DOFE, contact us by completing and submitting the form below. If you are looking for a specif part number, please include it with your message.